A complete list of Australia Rainforest Trees would include: trees from Queensland, NSW, ACT, SA, TAS, WA and Victoria. We are listing only examples of species found in each state and include many offered for sale. Many of these trees are available for sale in Australia will grow outside their natural habitat. Rainforests are sometimes seen as a tropical forest, however they are actually widespread and are found from Cape Yorke right through to Tasmania. And it is interesting to note that the Eucalyptus are represented in this group. Even in tropical areas species such as Eucalyptus crebra, Eucalyptus grandis, Eucalyptus macta, Eucalyptus pellita and Eucalyptus tereticornis are found to represent the genus. However rainforest trees do vary from Southern Australia to Northern Australia. They are a complex environment with tall trees to 50m however with a varying canopy. Smaller shrubs trees and palms trees below and a ground cover that vary from ferns to moss and other plants. What is a Rainforest ? A rainforest is not only one of relatively high rainfall, more importantly it is also a closed forest, with over 70% foliage cover in a continuous canopy. Rainforests are characterised by four layers. The emergent layer. The tall trees that rise above all. This will include some emergent Eucalypts. The canopy layer, this is the really important layer, this is the canopy that forms a roof over the forest, trapping moisture and raising humidity. The next is the Understory layer, small trees and shrubs, usually to around 3 – 4 m in height. The forest floor, mosses , lichens and not many plants at this level due to the lack of light. 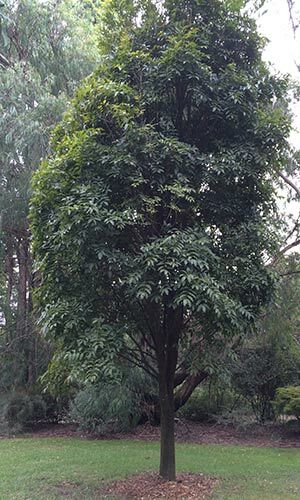 New south Wales rainforest trees include.